If you've been toying with thoughts of tonneau covers and Roll n Lock bed cover comes to mind then you have come to the right place. 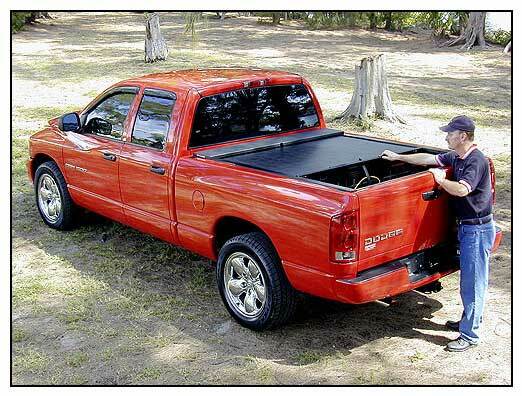 I will try and give you all the information you need to know to make the right decision on a tonneau cover for your Dodge, Ford, Chevy, Toyota or Nissan pickup. Sometimes you need to haul something that is taller than the bed and ease of access is a concern of everyone ... so How do you take it off? Sometimes taking the thing off can be a real hassle. The fiberglass hard tonneau covers require at least two people and then you have to be real careful not to scratch the paint. The Undercover tonneau covers are made of lightweight structural foam plastic and is easy to remove and reinstall but you still have to put it somewhere.